I have a full pair! Just wanted everyone to know that. I will blog more about that next week. Remember this hat? 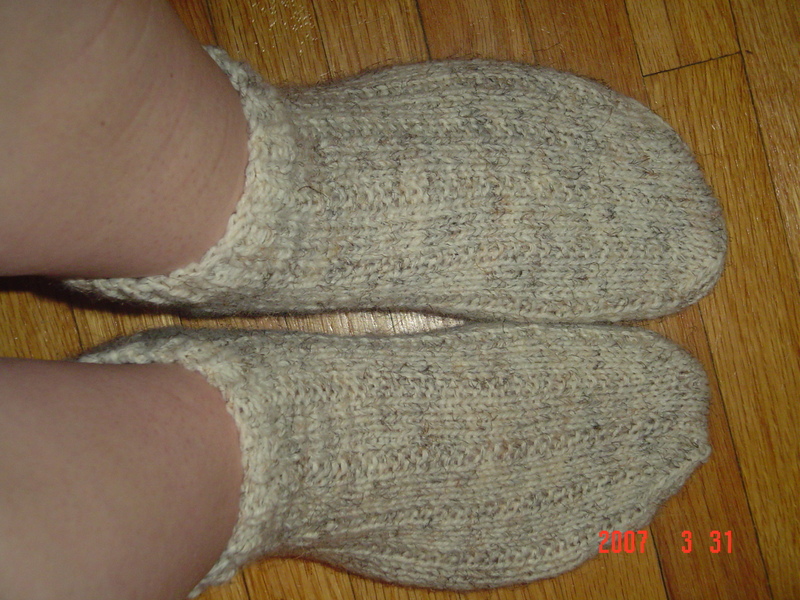 https://shellssells.wordpress.com/2007/02/22/knitting/ Well officially I decided to take it apart so I could have a complete pair of socks. I decided to do so for a couple reasons. First, I really am excited about my socks. Secondly, my brother won’t wear the hat so it is relatively (pun intended 😉 ) useless to me. Finally, I have the typical continental knitter gauge problems, my gauge is a lot different when knitting in the round than when knitting on straight needles. Since I did half and half on that hat, I wasn’t pleased with the end result. Now that I know better, I will knit it in the round next time, as I do like the hat! (I wonder if there is any fix to this issue besides learning to knit a different way?!) It is a decent hat and I do want to make it again, it will just require some different colors next time around 🙂 Now I have enough for my socks! Ok, if you don’t want to read the good, the bad, and the ugly of potty training you may not want to read this post. My daughter has been doing really well with her potty training. She is now staying in big girl undies almost all day at school. The exception is nap time where they use a pull up just in case. I used to take extra undies and clothes to school for accidents but I don’t seem to need to do that anymore. She is always in the same outfit she went in with when I go to pick her up. What is more bothersome at this point is that with the dry undies all day, she doesn’t like to wear diapers to bed. She takes them off if they are the least bit wet. Last night I replaced diapers 3 times. And the final time she had wet the bed so badly that I had to take all her clothes off and take her to her big girl bed. (When I got her up in the morning she had again taken the diaper off.) So what I would be saving in diapers all day I am replacing with diapers overnight. This isn’t going to work for me. We talked about how she must leave her diapers on today on the way to school, she tells me “Okay” but I don’t believe it. I am willing to give it another shot tonight but after that I am duct taping those suckers on her. I think the strong tape will make it that they are not stretchy enough to pull down. We shall see how it goes! Last evening, as it was getting cooler, and my daughter was getting ready for bed, I took her out on the porch and we sat in the rocking chair. I rocked her and sang to her as she put her head on my shoulder, and I wished this moment would never end. Though I think that I have many simple pleasures, this might be one of the best. I really want to make this shirt http://knitty.com/ISSUEspring07/PATTisabella.html perhaps in a coral color. Well, that is the dream anyhow, I will see what yarns I have around that might be appropriate for this project. I suspect I will have to find a way to lengthen it. On my socks, I can either take apart the hat for my brother that he didn’t want to have a full sock, look for more yarn in that color though I think it has been discontinued, or have a green toe of one sock. Not sure what I will do about it. I don’t really like the idea of buying more so perhaps I will take apart the hat. No decision made yet.